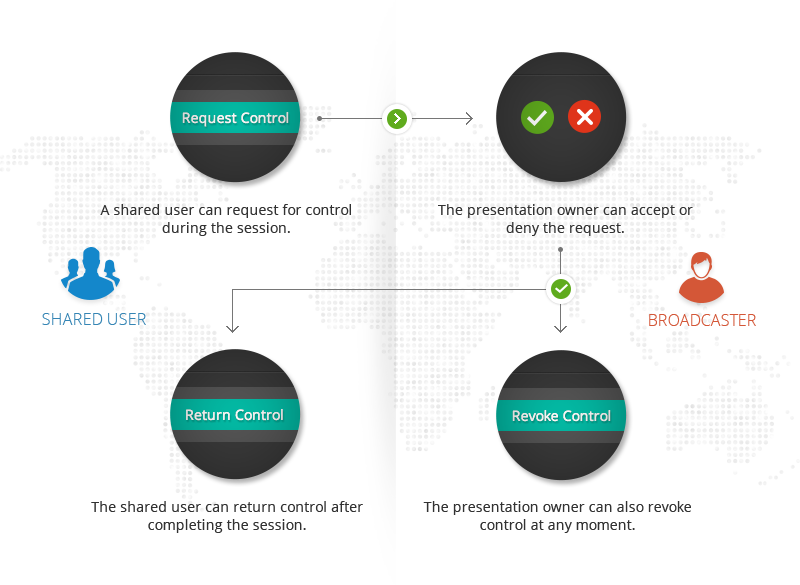 Zoho Show lets you deliver presentations remotely to any audience, across the globe. It doesn’t matter if your attendees are next door or miles away, they can still be active participants by joining your broadcast. Let your attendees follow along at their own pace. 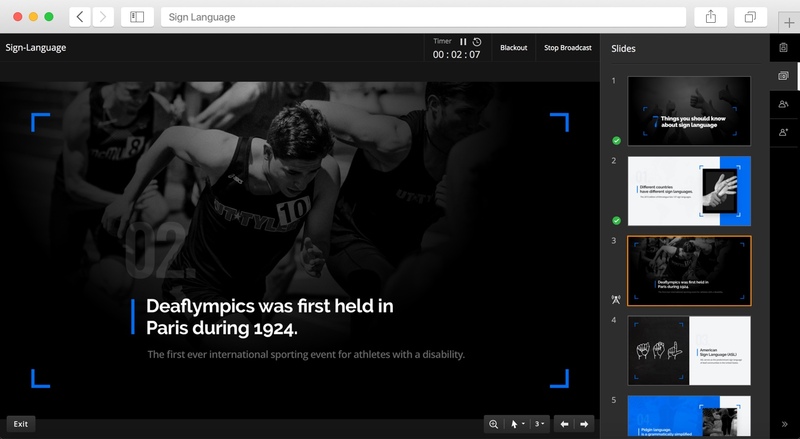 Audience members can browse through completed slides while the Presenter can view both the presenter notes and the entire slide list at a glance. Next State & Presenter’s Notes. Thumbnail list of all slides. Make your presentation compelling. 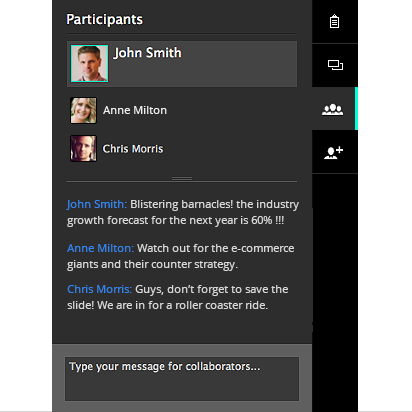 Get your audience to interact with you and each other using the chat panel. Foster meaningful discussions and improve participation as everyone gets a chance to express their views, ask questions and clarify doubts. As the main broadcaster and document owner, you can let - 'shared users' take control of the slide deck at any time. Users who have collaborated can request control. You have the power to grant and revoke the control from the user at any time. Let your attendees download the slide deck once you have delivered your talk. In many cases, people would want to revisit concepts days or even weeks after a talk - but don't have access or the contact information of the presenter. To save time and effort the attendees can download and save the file once the session ends. Focus on your slides, not your watch! Keep a track of the time elapsed within your broadcast window. Use the 'Blacken slides' feature to get your audience to focus on your narrative and not the slide content. View your speaker notes while you deliver. Use the slide notes to keep track of the key points. No software set up or installation. Forget paying a premium to download and install a screen sharing software. 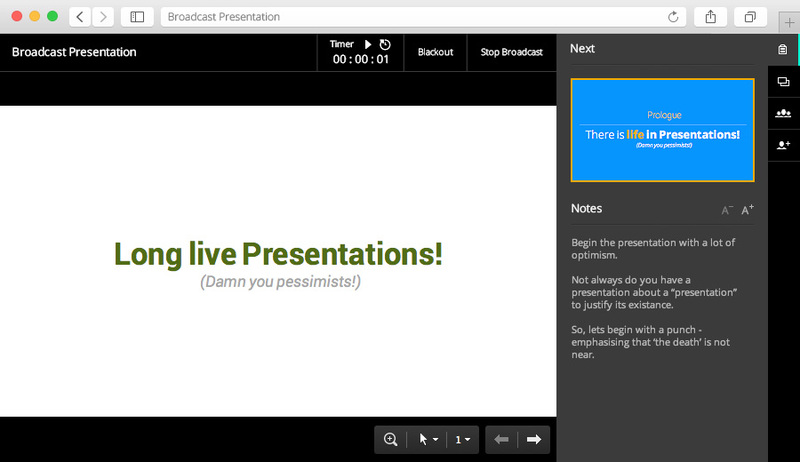 Zoho Show lets you broadcast right from within your presentation.